It’s that time of the year when thousands of qigong and tai chi practitioners gather to breathe together and to provide the world a healing image of our planet and our people. Please join us for this FREE event as we once again participate in World Tai Chi & Qigong Day 2019 to help spread the word. Where: Elizabeth Park – Prospect Ave. I-84 Exit 44, Hartford, CT 06106. We will be by or around the Rose Garden. For complete direction, please visit their website for detailed directions. We will also post directions at YYTA. What to Wear: Intermediate/Advanced students should wear their White or Black Linen uniform. For all others, YYTA school t-shirt & black pants or any casual comfortable clothing. In Case of rain: Regular classes will be held at YYTA. Qigong at 9am and Tai chi at 10am. Please check our website. This will take the place of the regular qigong and tai chi classes normally held that Saturday. However, in case of rain, we will be back at YYTA at our regular class time. Any additional information will be posted at the school. Please come and join us. Don’t forget to bring your family or friends with you. If you are not a YYTA student, please join us. This would be a good time to check us out and get a good gentle workout suitable for everyone done outdoors. Let’s share and spread the qi! Let’s share good food, drinks and great company amongst students, families and friends. Come celebrate with us! Where: Yin Yang Taijiquan Academy: 22E Andover drive, West Hartford CT.
A perfect time of the year to practice outside of YYTA and enjoy the beautiful foliage. This retreat is an introduction for people who want to explore Buddhism, its philosophy and practice. Central to the Buddhist teachings is a presentation of meditation practices designed to calm the mind and evoke insight into the dynamics of reality. We will begin the day with an introductory tour of Chuang Yen Monastery, one of the biggest Buddhist temple in north America. Then follow Master Guangzhi Xing to learn moving meditation, tai chi breathing patterns and stress release stretching techniques. A vegetarian lunch at the Five Contemplations Hall will give you a unique experience of Buddhist lifestyle. You will then join Buddhist monk inside the Kuan Yin Hall, a Tang Dynasty (618AD-907AD) style architecture, to practice meditation and learn the fundamentals of Buddhism. 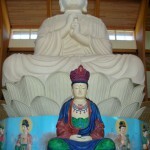 The five-colored statue of Kuan-Yin inside the Kuan Yin Hall is from Ming Dynasty and is the largest porcelain Kuan-Yin in the world. Complete your day refreshed, relaxed and relieved. To register: Please e-mail to info@MingsChina.com or visit www.MingsChina.com. Ming will also provide additional itinerary, clothing and temple etiquette. Please join us for this FREE event as we once again participate in World Tai Chi & Qigong Day 2016 to help spread the word. Where: Elizabeth Park – Prospect Ave. I-84 Exit 44, Hartford, CT 06106. We will be by the Rose Garden. For complete direction, please visit their website for detailed directions. We will also post directions at YYTA. and explore Shangri-La, the paradise-on-earth described in the famous novel Lost Horizon by James Hilton. Experience the poetically-named Tiger Leaping Gorge, and the incomparable UNESCO-listed Limestone Forest. Fly to Beijing. For a complete itinerary, please click China Trip 2018. For additional information, please call Yin Yang Tai Chi Academy at 860-953-3388. It’s that time again! 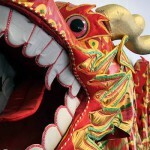 The Riverfront Dragon Boat & Asian Festival brings colorful and competitive dragon boat races to the river! Coupled with amazing entertainment and food at the Asian Festival where you’ll experience a full weekend of entertainment. Admission to the Asian Festival is FREE! This year Master Guang with his students decided to once again do the Dragonboat race. Last year’s Dragonboat race was exciting and we did well for our first time racing. Always a tough race and we will need all the support from everyone. Hoping to do better this year. PLease come and cheer as on as we cross that finish line. We never know when our race time will be, so just come and support us. There is always 3 heats. Last year our first race was at 8am. More info will be posted at YYTA. Please note that due to the Dragonboat race , all classes and workshops at the academy will be cancelled. Please join us for this FREE event as we once again participate in World Tai Chi & Qigong Day 2017 to help spread the word. Where: Elizabeth Park – Prospect Ave. I-84 Exit 44, Hartford, CT 06106. We will be by the Rose Garden. For complete directions, please visit their website for detailed directions. We will also post directions at YYTA. This year Master Guang with his students, friends and families will race a Dragonboat. This is a first for the school and excited to be a part of it. Our first race will be at 8:15am. Not only will it be hard being so early in the morning, but we will have a lot of tough competition out there. Please come and cheer as on as we, hopefully, cross that finish line. Please note that due to the festival, we will NOT have classes or workshops at the academy this Saturday. This trip will take the place of our Saturday class. We will begin the day with an introductory tour of Chuang Yen Monastery, one of the biggest Buddhist temple in north America. Then follow Master Guangzhi Xing to learn moving meditation, tai chi breathing patterns and stress release stretching techniques. A vegetarian lunch at the Five Contemplation Hall will give you a unique experience of Buddhist lifestyle. Fee: $10 donation per person. Please bring cash and will be collected when we get to the monastery. Return: Lunch is about 12ish and can elect to leave right after lunch or stay longer. It is up to you. Mode of Transportation: We will be carpooling and will meet at the YYTA Parking Lot. Souvenir Shop: Please support. They have a lot of nice items. But, only accepts cash or checks. To register: There is a sign-up sheet at the school. Please add your name and also write down if you can drive and how many can fit into your car. 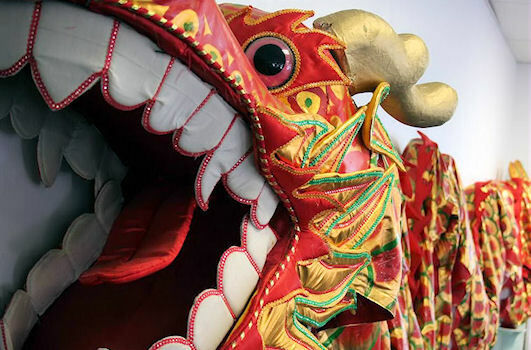 The 2-day festival features Asian entertainment, martial arts demonstrations, educational cultural booths, delicious Asian cuisine, games and activities for kids and much more. Join us at the Asian Festival where Master Guang will start us off with a group Qigong session. This will be followed by students doing short demos of different forms. We will conclude with a group participation of a training form. Time: 1:30 pm – 2:15 pm. Please show up at least 15 minutes early. We will start promptly at 1:30pm. Where: Martial Arts/Fitness Area at the Mortensen Riverfront Plaza – 300 Columbus Blvd Hartford CT. Please visit riverfront.org to get parking and additional information. Please join us for this FREE event as we once again participate in World Tai Chi & Qigong Day 2015 to help spread the word. Where: West Hartford Town Hall Grounds – 50 South Main St West Hartford, CT. We will be right infront of the Town Hall auditorium. For complete direction, please visit their website for detailed directions. We will also post directions at YYTA. Parking: The gate at the South Main Street exit will be lifted from 9:30 AM to 12:00 PM so students and participants can park for free. Please note that the gate will be down upon entering. Pull a ticket and park in the designated area. Sometimes people get flustered when they see the gate down. Not to worry!! What to Wear: YYTA school t-shirt & black pants or any casual comfortable clothing. Take part in some friendly games suitable for both children and adults. Adult participation is highly recommended to show our young at heart spirit. If you are not a YYTA student, you are more than welcome to join us. This would be a good time to check out our school and meet group of people who enjoys TaiChi and Qigong and getting together. Just email us that you plan to attend. We hope you will join us for food, drinks, and entertainment. Too much tai chi or qigong makes the belly hungry. We’ve gotten request for a return trip to Chinatown since it’s been 3 years ago. Our first stop will be a brunch of authentic northeastern style restaurant food from the hometown of Master Guang which is in Harbin. Then, stroll like locals and visit the Shaolin Temple and observe Kungfu training. 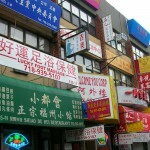 Later we take Flushing’s special shuttle van to Manhattan Chinatown for souvenir shopping, foot massage, tai chi at the park and dinner of Shanghai style dumpling soup. Then, return back to Flushing by shuttle van and ride home in the evening. Foot Massage: About $35 – $45 for 1 hour. Awesome massages. Parking: It is was free 3 years ago. Return to YYTA: around 6:00 pm or 7:00 pm. YYTA was invited to this year’s Wellness Fair at the University of St. Joseph in West Hartford. We will be doing a demo at the fair on Wednesday, October 1 from 12 – 1:30pm. It will be located at St. Joseph’s Bruyette Athenaeum. The Chapel Parking lot will be the best place to park to get to the Bruyette Athenaeum. The only tricky part will be parking. As of October 1, vehicles will only be allowed to enter the west entrance (closest to Trout Brook Drive) for those going to the Chapel Parking lot (Lots J and K). Please wear your YYTA t-shirt if you plan to attend. YYTA will be at this year’s NBC CT Health & Wellness Festival on Sunday, September 28th at the Connecticut Convention Center. Look for us at the Dance floor section of the CT Convention Center from 12 noon to 1 pm. Please come and join us. The more students the merrier. This really is a good venue for the public to see and try a little bit of qigong and tai chi. If you have not been to the NBC CT Health and Wellness, come and check it out this year. It’s a free event. You can elect to get a free flu shots, health screenings, meet wellness experts, experience new ways to stay fit and so much more. Time: 12 – 1:30 pm. Please show up at least 15 minutes early. Where: Dance Floor – Connecticut Convention Center: 100 Columbus Blvd, Hartford, CT 06103. Cost: Free for the event. Parking is not free unless you find parking on the side streets. What to Wear: Students should wear YYTA t-shirt. Bring your family and friends and see us at the NBC Health & Wellness. Admission is FREE! The Riverfront Dragon Boat & Asian Festival brings colorful and competitive dragon boat races to the river! Coupled with amazing entertainment and food at the Asian Festival where you’ll experience a full weekend of entertainment. Admission to the Asian Festival is FREE! Time: 1:30 pm – 3:00 pm. Please show up at least 15 minutes early. We will start promptly at 1:30pm. Please note that due to the festival, we will NOT have classes or workshops at the school this Saturday. Please join us on Saturday as thousands of qigong and tai chi practitioners gather to breathe together and to provide the world a healing image of our planet and our people. YYTA will once again be participating in World Tai Chi & Qigong Day 2014 to help spread the word. What to Wear: You can either wear your linen uniform, YYTA school t-shirt & black pants or any casual comfortable clothing. In Case of rain: Regular classes will be held at YYTA. Qigong at 9am and Tai chi at 10am. If you attended our Chinese New Year party in February, you couldn’t miss and resist the beautiful display of mochi balls made by Ming and her sister Lisa. Not only were they beautiful but they tasted even better. We are putting a workshop together based on many request we’ve gotten from attendees and from some who didn’t even attend the party. Mochi balls can be eaten anytime of the day, but it’s great as a snack and especially with hot tea. You can easily freeze mochi balls, so making a lot shouldn’t be a problem. For this workshop, we will be making 2 kinds of mochi balls. The first one will be Green Tea Mochi with red bean and the second will be purple yam with green bean paste. Recipes and instructions will be provided during the workshop. All we asked is for you to bring an apron, a cookie sheet and a container to bring home the mochi balls you just created and of course, to have some fun. Sign-up sheet will be available at YYTA. Our Chinese New Year celebration will be held on February 15. Besides celebrating the new year, we will also be celebrating the 20th anniversary of Bridging Cultures, Lives and Hearts to China through Ming’s Chinese Cultural Exchange (CCE)Program. Our celebration will be joined by both YYTA students and their families and also the Chinese Cultural Exchange parents and their children. If you are not a YYTA student, you are more than welcome to join us. This would be a good time to check out our school and meet a great group of people who enjoy working out and getting together. Just email us that you plan to attend. Master Guang, several of his students and their families visited Tibet last month. They have been generous enough to prepare a picture slide show of their visit and will discuss their experience. 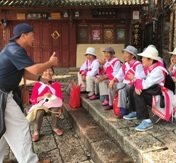 While there, the group had a unique opportunity to meet with Tibetan educators who were very candid and open about their experience that the group would like to share with everyone. In addition, we have the special privilege of having a long time friend of the Xing’s join us to share her unique perspective on Tibet. If you have always wanted to learn a little bit about Tibet and hear their experience, please join us in this 2 hour event. Finger food and drinks will be provided. Cost: YYTA Students & Families: Please bring pot luck food to share. Time: 1:30 pm – 2:15pm. Please show up at least 30 minutes early. We will start promptly at 1:30pm. Please join us for a fun get together to learn, appreciate and fill our tummies with some delicious dim sum. We will travel to New Haven after our last workshop on Saturday. If interested, Sign-up sheet will be available at the school or email us. 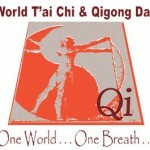 YYTA will once again be participating in World Tai Chi & Qigong Day 2013 to help spread the word. Where: Elizabeth Park – 1561 Asylum Avenue West Hartford, CT 06117. We will be near the Rose Garden. For complete direction, please visit their website for detailed directions. We will also post directions at YYTA. Chinese New Year is the most important Chinese holiday. Let’s celebrate and welcome “The Year of the Snake” with a little get together! Our 2011 end of the year party was a great turn out. YYTA was packed especially around the food table. 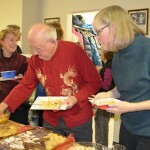 Since the potluck worked so well at our last party, why change it? We will put out a sign-up sheet soon. Please put your name down for a dish, appetizer, munchies, drinks, desserts, paper goods, set-up, cleanup, etc. Just like our last get together, it won’t be complete without some entertainment. Last year, Peter started us off with some singing and guitar playing. Almost everyone was brave enough and tried Swei and ChaoChi’s line dancing. Richard did his famous “Hambone” a rhythmic knee and chest slapping motion. Aaron played a chinese instrument. Please sign up for your special talent. Maybe we can convince Master Guang to sing this year or do a native dance from his hometown of Harbin. If you are not a YYTA student and would like to join in on the fun, this would be a good time to check out our school and meet a great group of people who enjoy getting together especially when food is involved. You are most welcome to join us, but please email us with a dish to share. Don’t miss it this year! Join Us! Discover the energy and joy of qi as Master Xing leads you through a gentle qigong workshop guaranteed to get your life force flowing. The ancient secrets of qigong are based on a simple system of wellness exercises combining breathing, movement and concentration that are easy to learn and suitable for everyone. It also contributes to improved balance, flexibility, and coordination. Join us for this two hour qigong workshop with beautiful soothing music. This workshop is appropriate for new or current students. Everyone is urged to bring a friend, relative or anyone who wishes to discover the wonderful health benefits of qigong! With qigong to enrich the soul, we will also nourish the body with wonderful dumplings (vegetarian and/or meat filled) and warm our insides with either sake or hot tea. If you are new and even slightly interested, it’s a great way to learn about qigong, check out the school, meet students and get to know our fearless leader. It truly is a great way to spend a Friday night! Curious, overwhelmed or intimidated by Asian markets? Interested in learning more about popular Asian produce, products and shortcut tips for making classic or creative Asian dishes at home? Do you enjoy new food, culture, travel and shopping? If so, this tour is for you. 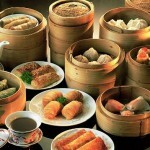 Join Ming Hua He, well-known Chinese culture and travel expert, for this fun, unique culinary and cultural experience! Begin your guided tour at A Dong Asian Supermarket, where you will learn how to find and buy popular and traditional Asian groceries. 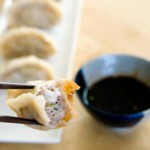 Then, drive to CCE for the workshop site for a dumpling cooking class. You will learn the secrets of making authentic home-style dumplings. Please bring your own apron and a cookie sheet or pizza pan to take the leftovers home. And, don’t forget to take a notepad with you for some insightful information. End our tour with an excellent Asian Acupressure Massage for a small fee. Price includes transportation, admission to tea ceremony and dim sum brunch.